As we jet off on a well-earned holiday, none of us likes to consider what will happen if something goes wrong during the trip. After weeks or months of careful planning and anticipation - not to mention expense - the thought that our well-laid plans might unravel due to circumstances outside our own control can be discomforting, to say the least. Do you go on holiday more than once a year? That's why it's so important to have comprehensive travel insurance in place from a reputable provider, so that you can rest assured that, should the worst happen, you have first-class cover in place. If you are planning to travel abroad on two or more occasions within the next twelve months, then a multi trip travel insurance policy could save you a lot of money, compared to single trip travel insurance especially if you normally take your travel agent's policies. But, with so many providers to choose from, it's easy to become bamboozled by all the options available. Adrian Flux now offers the complete solution, with a range of flexible travel insurance options, tailored to your needs. 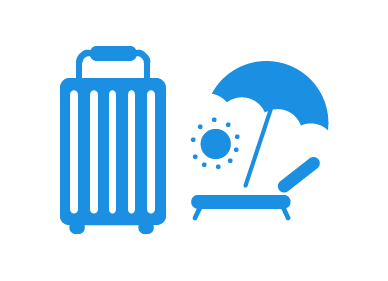 Our single trip travel insurance and multi trip policies include a host of benefits and features, and a wide range of bolt-on options mean you will pay only for the cover you need, and no more. What's more, our prices are extremely competitive. Your whole family could be covered for less than £85 for the year. Even better, there's no limit to the number of children covered by our family policies. Our cover for individuals and couples also offers excellent value for money. Up to £5,000 if your trip is cancelled or cut short. Medical and other expenses up to £15 million. Personal belongings and luggage up to £2,000. Money and documents up to £250. Missed departure expenses (travel & accommodation) up to £500. Personal Liability cover up to £2 million. Legal expenses up to £50,000. Delay cover up to £250. Loss of passport up to £300. Temporary loss of belongings up to £350. Hospital benefit up to £1,000. Business trip & business equipment cover. For more information, and to receive your free, no obligation quote, call us free on 0800 089 0203.